Now closed; was a Japanese "bar and food emporium" opposite Smithfield Market. According to an email sent to the Saki mailing list on 27 May 2011, it was forced to close due to a drop-off in business following (untrue) rumours of radioactive-contaminated food after the Japanese earthquake. A Japanese "bar and food emporium" opposite Smithfield Market. 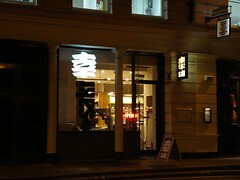 The ground floor is taken up with a small shop selling various Japanese kitchenware and food items, including a range of sakes, and the basement is divided into a cocktail bar and a restaurant. The restaurant side has a sushi counter, a large black marble communal table, and a number of smaller tables, one (at least) of them in a partly screened off area for extra privacy. It's quite elegant without being overdone. Kake and doop visited in October 2007, and had the six-course kaiseki menu served at the sushi bar. The sushi chef was very chatty and friendly; we had a good discussion about Japanese and British ingredients, and we were very pleased that we chose to sit at the bar. A more extensive review of this visit is available here. In May 2008, they introduced a strictly vegetarian (i.e. vegan) version of the kaiseki menu, having imported a specialist chef from Japan. Kake, doop, and Juliet tried this out in June 2008 and were very impressed. Kake, being not even an actual vegan, would have trouble choosing between this and the omnivorous version we had last time. Choice of ingredients, cooking methods, and presentation were all well-varied, and spot-on. It was probably the best vegan meal I've ever eaten, and that is not intended as faint praise. The only possible niggle is that the front-of-house guy was very enthusiastic, to the point of quizzing us on every course to see if we'd identified the ingredients; although we were OK with this, it might well grate on some. The vegan kaiseki menu is only available in the evening, and you need to give 24 hours' notice if you want it. If you're vegan, you do want it. The cocktail bar is small but pretty nice; all mirrors and black leather and decent, not-too-loud music. There are a few low sofa-like things, but most of the seating consists of tall barstools and tables. The cocktail menu is extensive, with a "cocktail of the month" available each month, and includes sake and shochu cocktails as well as twists on more standard offerings such as Bloody Mary. Kake, doop, Juliet, and Kat have tried various ones on a few occasions in 2007-2008 and been very pleased - and we didn't feel they were too overpriced at £8-9 apiece. Bar snacks (kobachi) are available; the edamame that Kake and Juliet tried in June 2008 were just right; Juliet was particularly pleased that they used good salt. Kake and Kat spent the evening in the cocktail bar in September 2008, and tried a selection of the other bar snacks too. It was a little tricky to actually get someone to take our order for these after the first round, so we wouldn't recommend this as an evening's sustenance; it's more something to take the edge off before you go for a proper meal. We were the only people in the bar for much of the evening, though it was early in the week. Kake has never seen the bar crowded. Note that they keep a tight rein on the cocktail menus - you get brought one when you sit down, and it's taken away again as soon as you order, so if you want another one you have to flag someone down again and ask for the menu back. lathos tells Kake that this is the way it works in Japan; if you want to keep the menu you have to explicitly say so. Last visited by Kake and Kat, September 2008. Last edited 2017-12-17 15:53:23 (version 21; diff). List all versions. Page last edited 2017-12-17 15:53:23 (version 21).